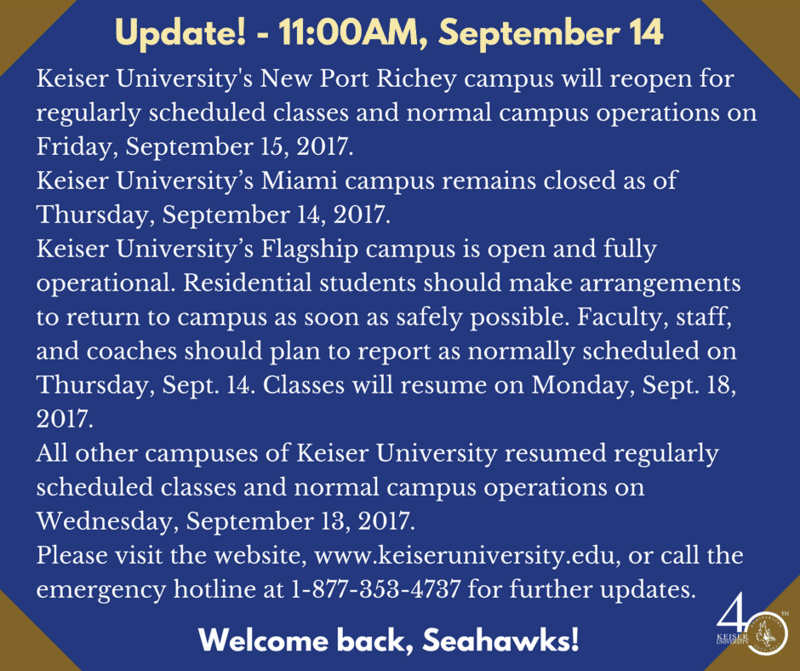 Keiser University’s New Port Richey campus will reopen for regularly scheduled classes and normal campus operations on Friday, September 15, 2017. Keiser University’s Miami campus remains closed as of Thursday, September 14, 2017. Keiser University’s Flagship campus is open and fully operational. Residential students should make arrangements to return to campus as soon as safely possible. Faculty, staff, and coaches should plan to report as normally scheduled on Thursday, Sept. 14. Classes will resume on Monday, Sept. 18, 2017. All other campuses of Keiser University will resume regularly scheduled classes and normal campus operations on Wednesday, September 13, 2017. Please visit the website www.keiseruniversity.edu or call the emergency hotline at 1-877-353-4737 for further updates.